A rapidly growing population and a subsequently rising demand for food has put pressure on farmers to equip themselves with the latest and advanced mechanized farming techniques. This has resulted in the increased demand for farm tractors in North America and Europe. The market is also supported by favorable government policies encouraging the usage as well as purchase of agro machinery and various farming equipment. Easy access to credit provided by country-specific governments in these two regions has benefited the adoption of farm tractors in Europe and North America. The North America and Europe farm tractor market is expected to record sales volume of 582.2 thousands units by 2024. By revenue, the market is projected to expand from US$13.6 bn in 2015 to US$17.23 bn by 2024. While the North America farm tractors market will register a modest 3.0% CAGR by value during the forecast period, Europe is expected to exhibit a 5.4% CAGR from 2016 to 2024. Farm tractors are equipped with engines having different horsepower. Based on horsepower, the farm tractor market is classified into less than 40 HP, 40 HP–80 HP, 80 HP–120 HP, 120 HP–180 HP, 180 HP–250 HP, and more than 250 HP. Of these, the less than 40 HP segment occupies a major chunk of the North America and Europe farm tractors market, especially in the U.S. and Germany. Followed by the 40 HP–80 HP segment, these two are expected to collectively account for 62% and 69% respectively in North America and Europe in 2015. Banking on the positive demand for the low horsepower segment, tractor manufacturers are increasingly focusing on the less than 40 HP segment to maintain their market position. From a geographical standpoint, North America dominated the farm tractor market in 2015 in terms of unit shipments. The market in North America is estimated to amount to US$9.14 bn in 2016, driven by the positive growth in the U.S. farm tractor market, which witnessed significant demand for small and compact tractors in the below 40 HP horsepower category. Conversely, the farm tractor market in Canada is estimated to witness a steep decline in shipments owing to the frequent fluctuation and weakening of the Canadian dollar. The farm tractor market across all the horsepower segments in the country is estimated to witness a dip in 2016 as well. Moreover, all the major tractor manufacturers have been undergoing a tough time in maintaining their market share in Canada as a large volume of the local demand is met through imports, which escalates the chances of currency fluctuation. In 2015, the Europe farm tractor market recorded a shipment of 153 thousand units, with Germany being the top contributor. 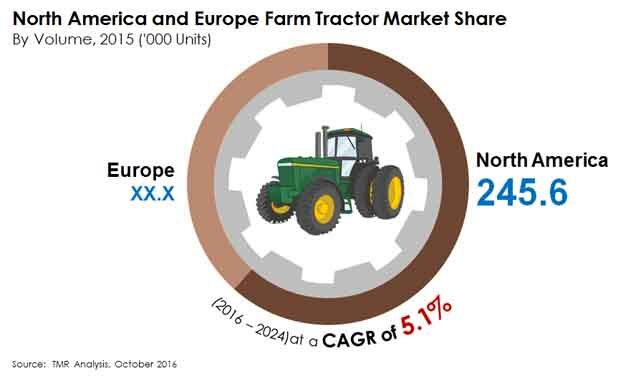 France, the U.K., and Italy are also anticipated to be prominent contributors to the Europe farm tractor market. European countries such as the U.K, Finland, and the Netherlands, have relatively larger farms in terms of area and therefore, farm tractors above 80 HP are estimated to exhibit significant growth in demand in these countries. This report on the North America and Europe Farm Tractor market provides analysis for the period 2014–2024, wherein 2015 is the base year and the period from 2016 to 2024 is the forecast period. Data for 2014 has been included as historical information. The report covers all the prevalent trends and technologies playing a vital role in the growth of the farm tractor market over the forecast period in both the regions. The report also highlights various drivers, restraints, and opportunities expected to influence the market growth during the forecast period till 2024. The study provides a holistic perspective on market growth throughout the above forecast period in terms of revenue and volume (in US$ Bn and ‘000 Units), across North America and Europe geographies. Cross segment analysis for the U.S and Germany farm tractor market has also been provided in the report. Other Europe and North America countries for which market size analysis has been provided within the scope of the study include Canada, the U.K. and France. The report also provides key developments in farm tractor industry that impacted the farm tractor industry and changed its landscape. The key market indicators provided in the report analyzes the country wise arable land area available in the year 2015. This research report provides in-depth analysis of the North America and Europe farm tractor market on the basis of horsepower. The horsepower segment is classified into less than 40 HP, 40 HP – 80 HP, 81 HP – 120 HP, 121 HP – 180 HP, 181 HP – 250 HP, and more than 250 HP. Additionally, the farm tractor market report also covers horsepower category wise price trend analysis for the all the countries covered in the scope of study and analyzes the impact of fluctuating prices the market in the two regions. The report also provides Porters Five Force Analysis for the North America and Europe farm tractor market. This model provides comprehensive analysis of various attributes, and highlights vital factors acting as entry barriers to new players in farm tractor market, anticipated threat of substitutes for farm tractors, analysis of supplier’s and buyer’s power, and degree of competition in the farm tractor market. The report also provides value chain analysis covering key actors in the farm tractor value chain including component manufactures, OEMs (tractor), distribution channel partners, and the end-users. In addition to this, forward and backward integration scenarios is covered in the study which analyses the changing scenarios of widening scope of work and services provided by tractor manufacturers. The market attractiveness analysis for North America and Europe regions is also included within the scope of the research report. The market attractiveness analysis compares the farm tractor market of prominent countries in both the regions based on market size, potential opportunities, and the Compounded Annual Growth Rate (CAGR). The report provides competition landscape covering the market share of the leading players in the Europe and North America market based on their revenues in 2015. In addition to this, competition matrix compares and analyzes prominent players in terms of their capabilities and future potential. This includes attributes such as market position, offerings, R&D focus, top line growth, market share, segment growth infrastructure facilities and future outlook. Company profiles of the players covered in the study includes detailed information and analysis based on business overview, strategies, product offering. Furthermore, SWOT analysis of these players is also covered in the company profile section. The key players in the North America and Europe farm tractor market covered in the study includes Deere and Company, CNH Industrial N.V., Kubota Corporation, SDF Group, AGCO Corporation, Class KGaAmbH, and Mahindra USA Inc., Daedong USA, Inc., Argo Tractors S.P.A. and International Tractors Ltd., among others.